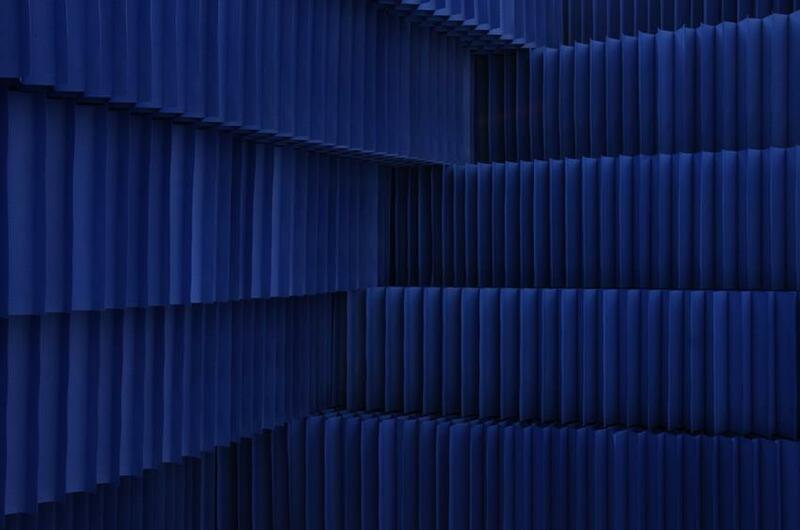 "blue room"- love the cloud soft lighting too! 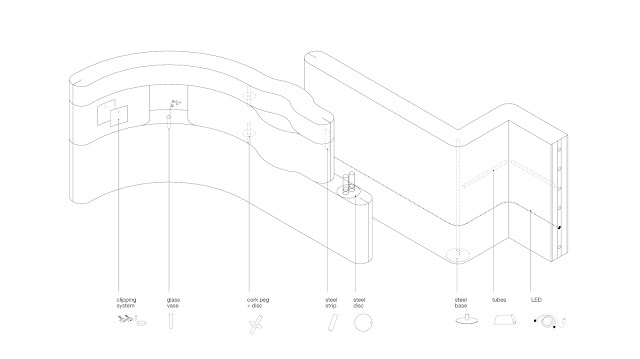 The process of making is very much a part of molo's design process. The duo Canadian architect team believes it is important to be involved in the manufacturing and crafting of the things they design. Stephanie adds, " we learn from what we make, inspiration found in the process leads in unexpected directions and brings us to a deeper understanding of what we are working with." From architecture to intimate temporal spaces to lighting, molo's explorations are extremely innovative. Read on as I was able to interview Stephanie. She takes us behind the design of molo's Nebuta musuem and the inspired story behind their collection of flexible walls, blocks and seating. What is the meaning of your brand name, molo? The name molo is an acronym for "middle ones little ones". 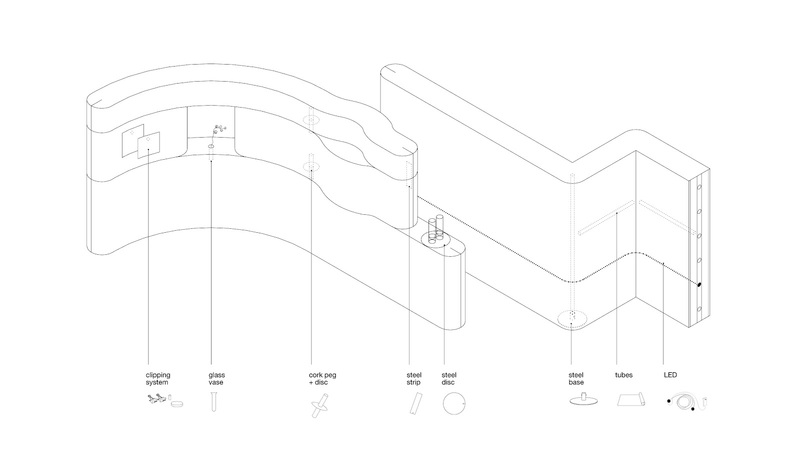 My partner Todd and I are Architects and when we first formed molo, to put some of the furniture and smaller functional items we design into production, we recognized that many of the design concepts and considerations for our smaller scaled work are the same as our work at an architectural scale. For example when designing a tea set we were thinking of how the quality of light from the candle forms a space, and along with the warmth, scent and beautiful ritual of steeping and sharing tea, it becomes a center for people to gather around. And so the name molo derives from this notion of space making with smaller tactile objects. A nice coincidence is that in Spanish and Japanese "molo" is a sort of slang word meaning "cool little things". 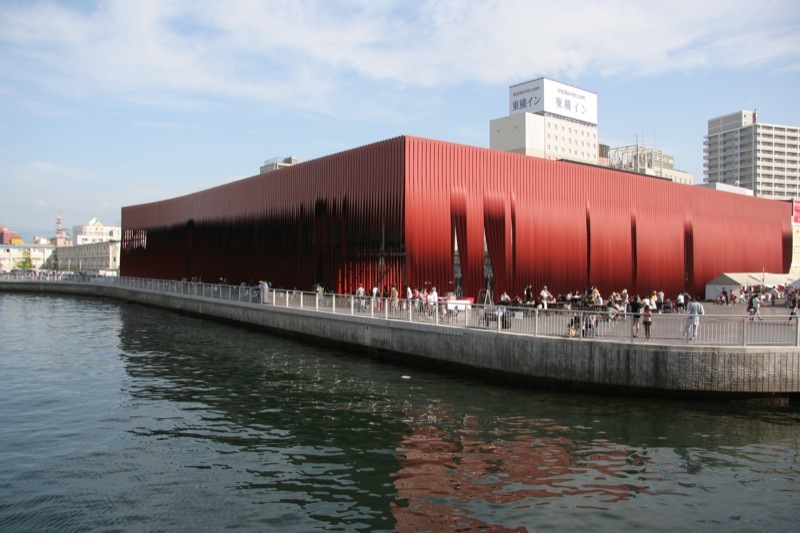 The elegant ribbon-like façade you designed for the Nebuta Museum in Japan is beautiful. 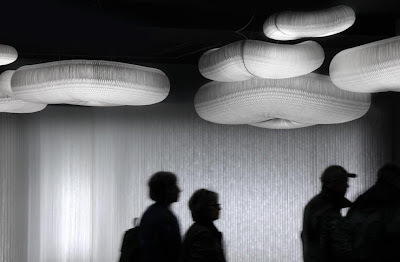 molo's ability to sculpt a simple idea and form it into a play of light and kinetic function is innovative. 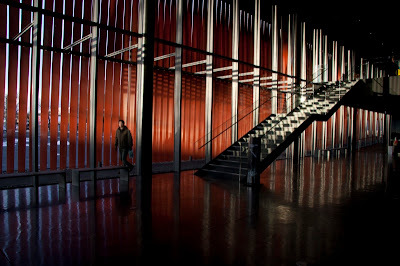 Can you take us behind the design of your artistic- vision. What inspired its form? 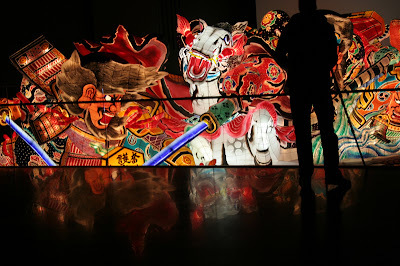 Nebuta Matsuri, one of the three most famous and largest festivals in all of Japan, it is a form of storytelling during which heroes, demons and creatures from history and myth come to life as large-scale (9 x 7 x 5.5m) paper lanterns (Nebuta) illuminated from within. 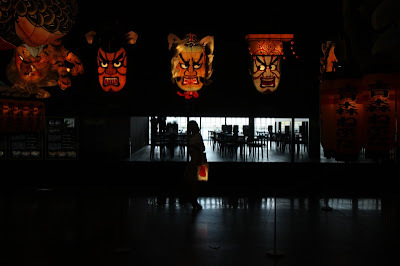 The Nebuta House is a dwelling for these mythical beings to reside. Each year the five best Nebuta, selected for their creative artistry and craftsmanship, will take the place of the five Nebuta selected from the previous year. Functionally the institution is meant to share the tradition, archive the history and nurture the future of this unique cultural art form. 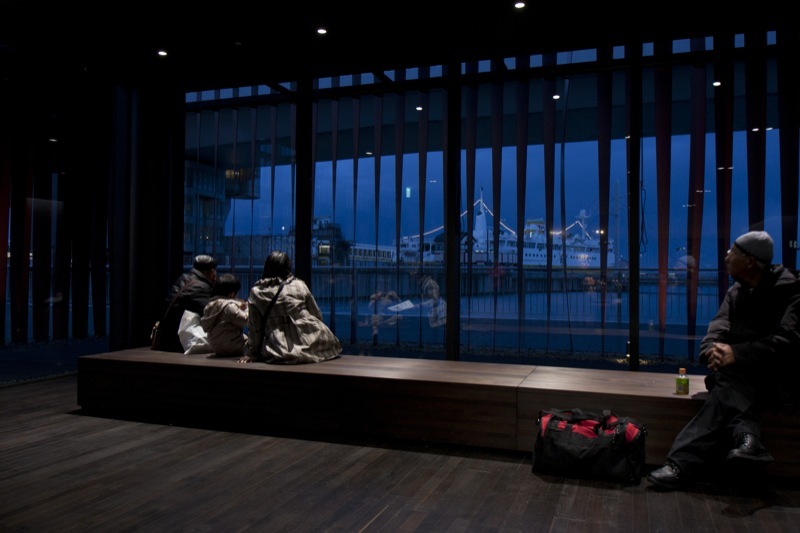 Located in front of Aomori train station, where the city meets the sea, the building opened January 5th, 2011. 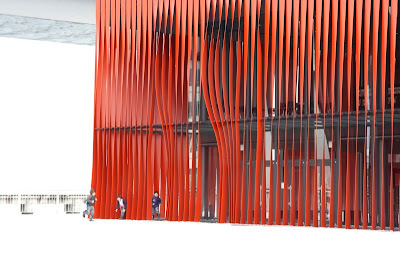 The building is enclosed by ribbons of twisted steel, enamel-coated deep vibrant red and individually shaped to create variation: openings for light, areas of opacity, views, or opportunities for pedestrian circulation. For each steel ribbon,the bottom was set to a unique and specific angle, with thought to how sunlight would permeate the ribbons as it moved throughout the day, while the top part of each ribbon remains parallel to the building. 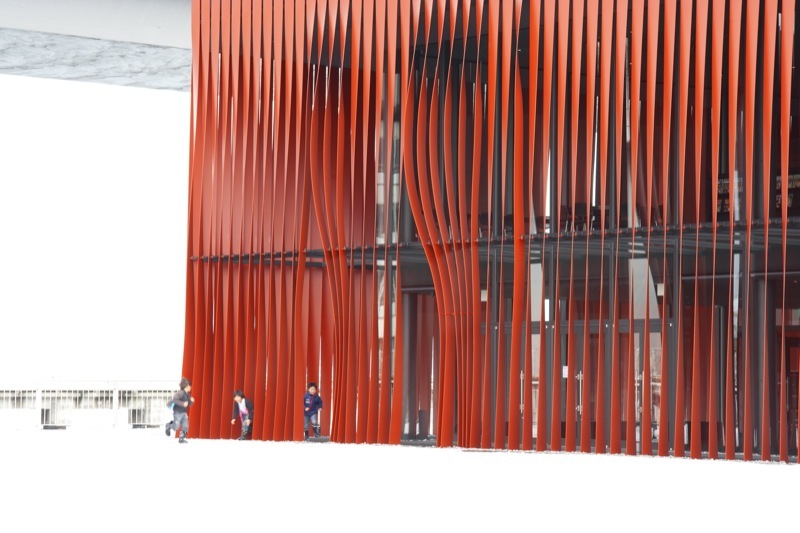 In between these fixed points, some of the ribbons follow a natural curve while others were selected to have further bending and shaping to create larger openings and an abstract expression of wind. The steelworkers executed great skill and judgment interpreting the images from the 1:50 scale model that had been made from ribbons of paper, into ribbons of steel (9mm thick x 300mm wide x 12 meters high). 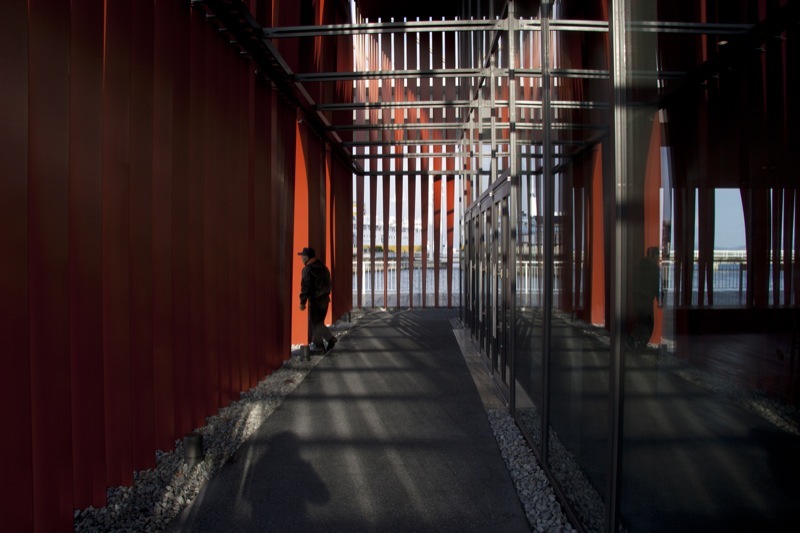 In this way each ribbon was individually crafted during prefabrication, then manually adjusted on-site during installation. No part of the finished screen is the result of computer-aided fabrication; like all things handmade, human intervention enlivens function and expression. 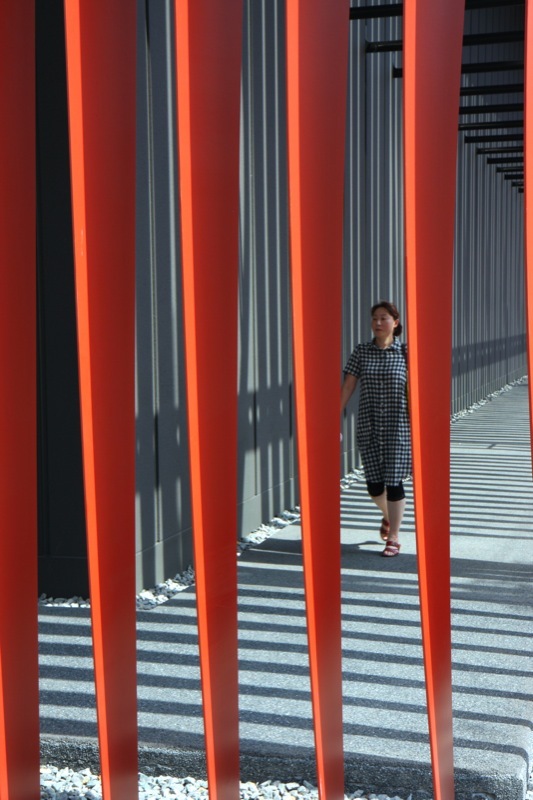 The ribbon screen façade creates a sheltered outdoor perimeter space called the “engawa”, a spatial concept originating in traditional Japanese houses. 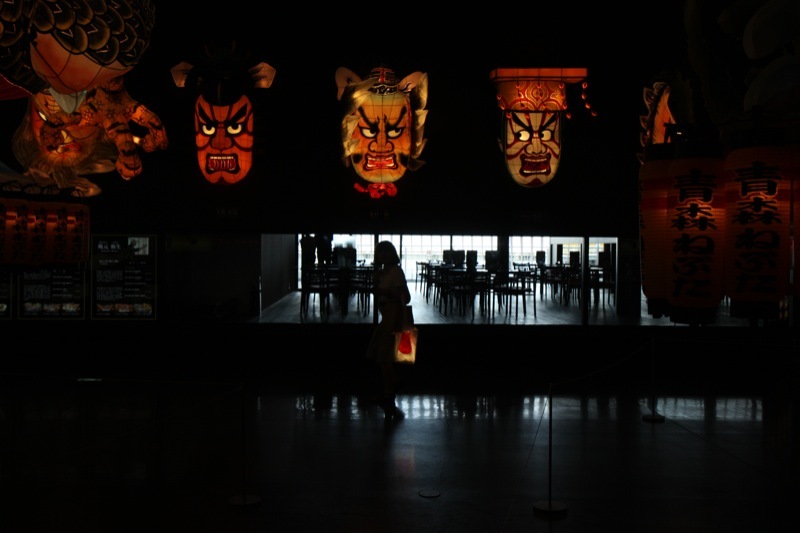 In this case, a dwelling for giant paper heroes, demons and creatures, the engawa acts as a threshold between the contemporary world of the city and the world of history and myth. 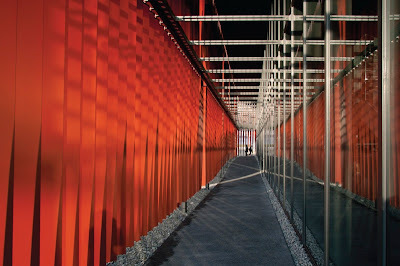 Shadows cast on the walls and floor through the exterior ribbons have the effect of creating a new material. 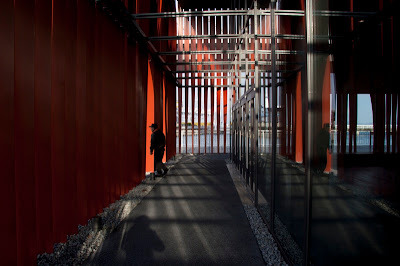 Shadow and light become another screen– the convergence of material, light, shadow and reflection changing with the sun and weather. Homogeneous, grey, box-like buildings constitute much of the surrounding cityscape. Commonplace objects like power lines and vending machines are dispersed throughout the uniformity. 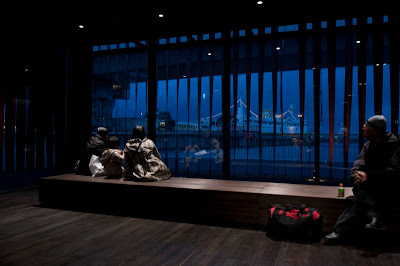 Here, the building appears as a vibrant curtain at the street’s end – activating the streetscape, transforming everyday experience into theatre. Bicycles and traffic passing by, city workers breaking to eat or children playing in the snow take on a quality of performance and play. 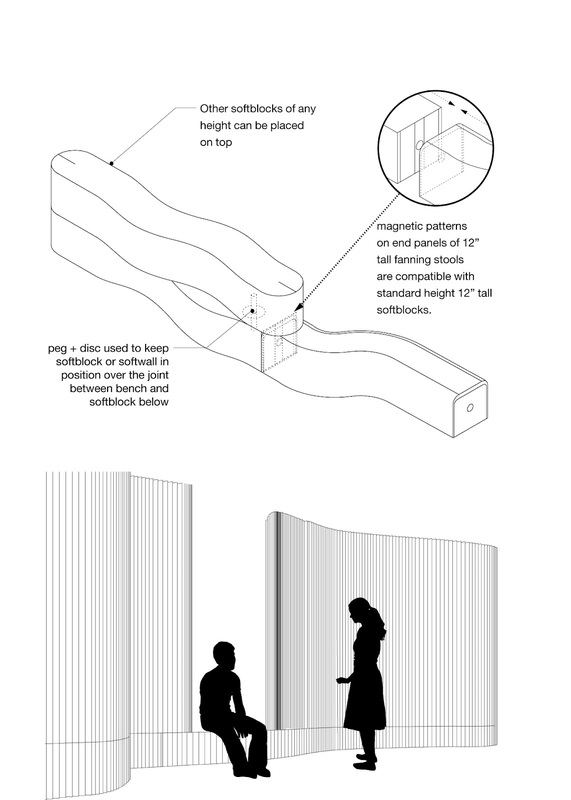 How did the collection of flexible walls, building blocks, and seating come about? Can you describe your discoveries? Is there a story? 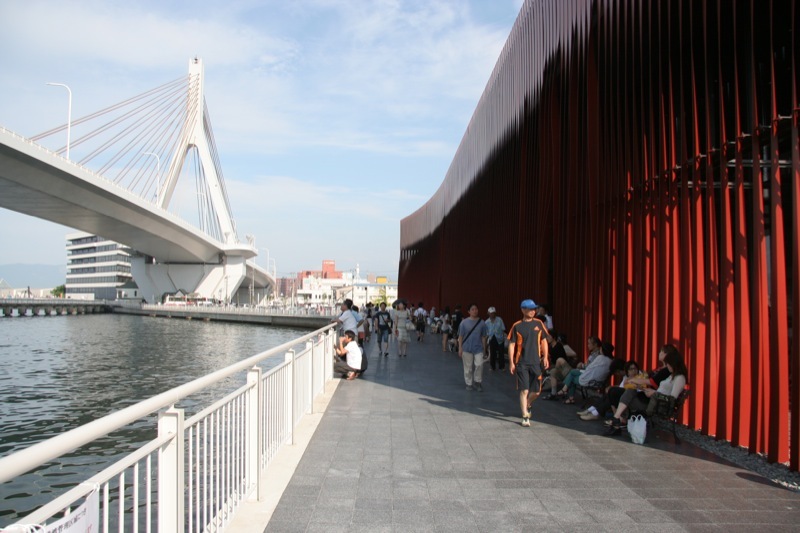 We were working on several architectural competitions with urban sites in different parts of the world, the one thing all three projects had in common was a need for flexibility to make efficient use of space. At the same time we were working on the design of a speaker cone for a stereo system and in thinking about how to create a complex three dimension compound curve with simple means, we thought of honeycomb tissue paper wedding bell decorations... 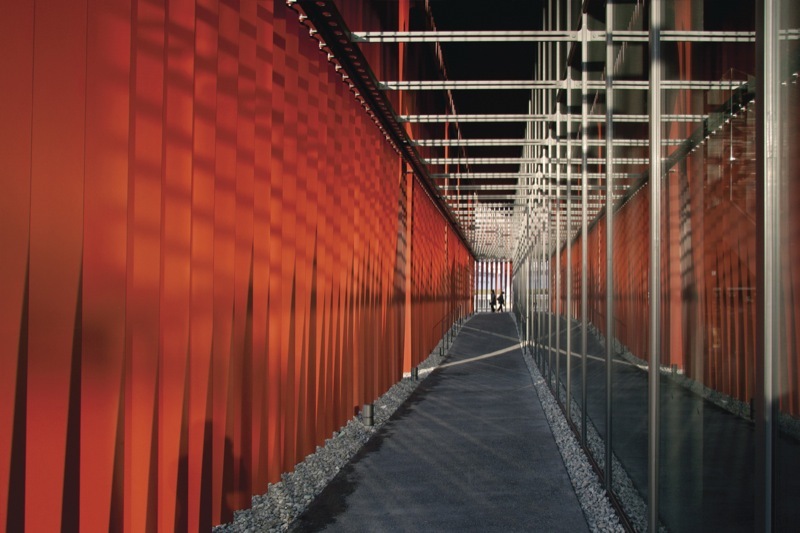 The flexibility of these honeycomb structures immediately struck us. 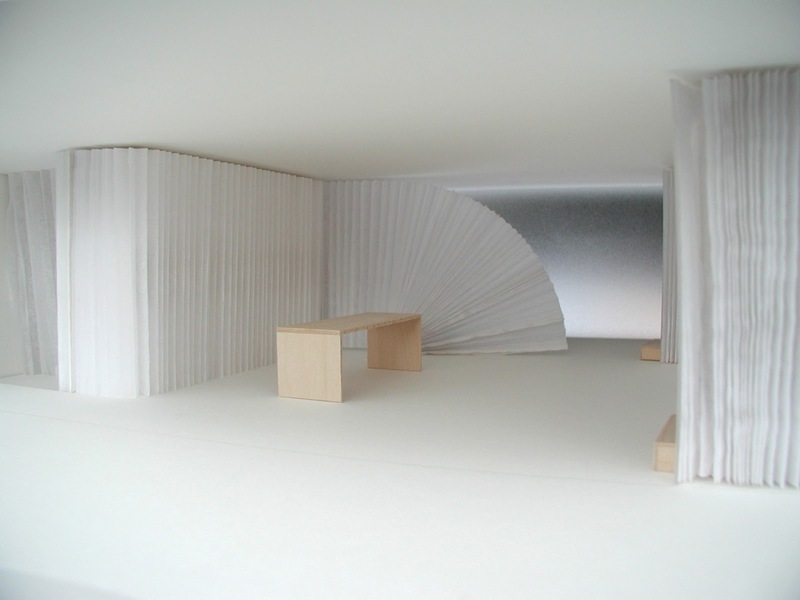 We began making small paper models of bedrooms and private work spaces that could fold away when you are not using them, loaning extra space to the main living area of the house. 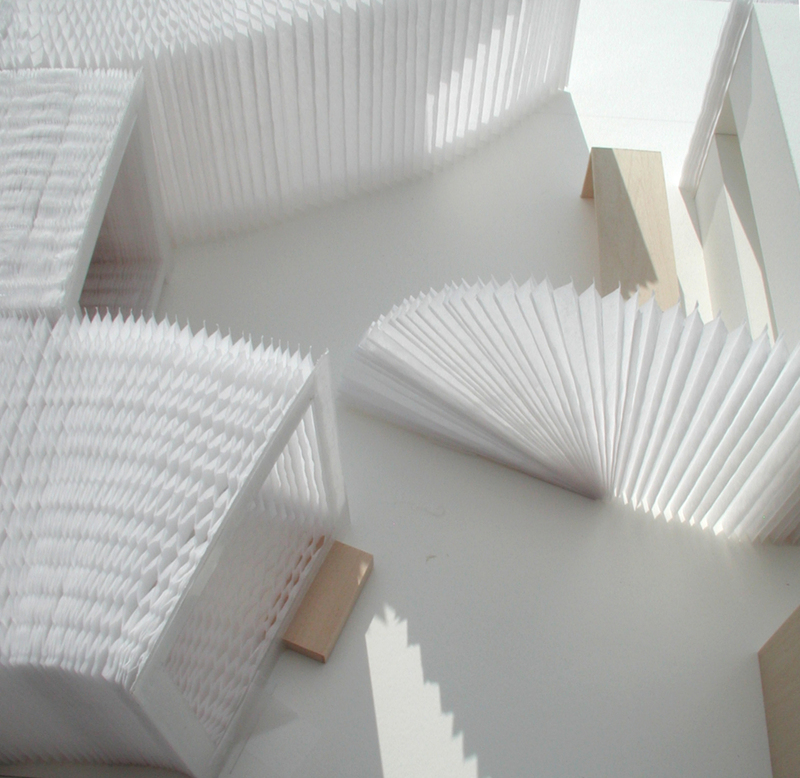 In the process of scaling up the small paper models to full size, we thought we would switch over to a "real" building material but to our delight we discovered that even the thinnest sheets of paper provide great strength when laminated into a honeycomb structure. The soft pleating wall has the ability to redefine space. Can you describe its construction, how it works, how it connects and some of its configurations? 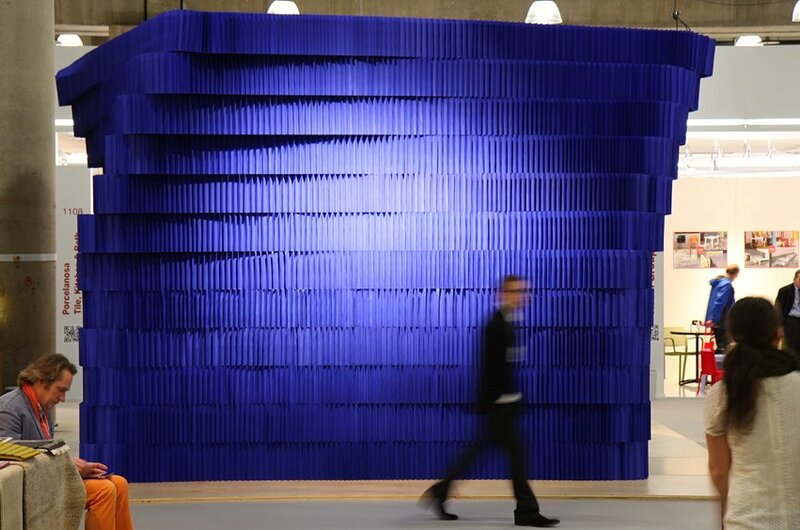 Each softwall is a flexible honeycomb partition wall made from parallel layers of paper or textile material, that can expand about 100 x its compressed dimension of less than 2", to just over 15' long! 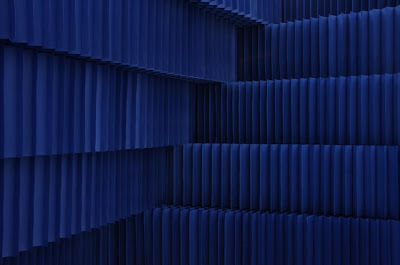 softwall, softblock and softseating belong to a modular system that allows you to click two or more elements together simply and seamlessly with concealed magnets. 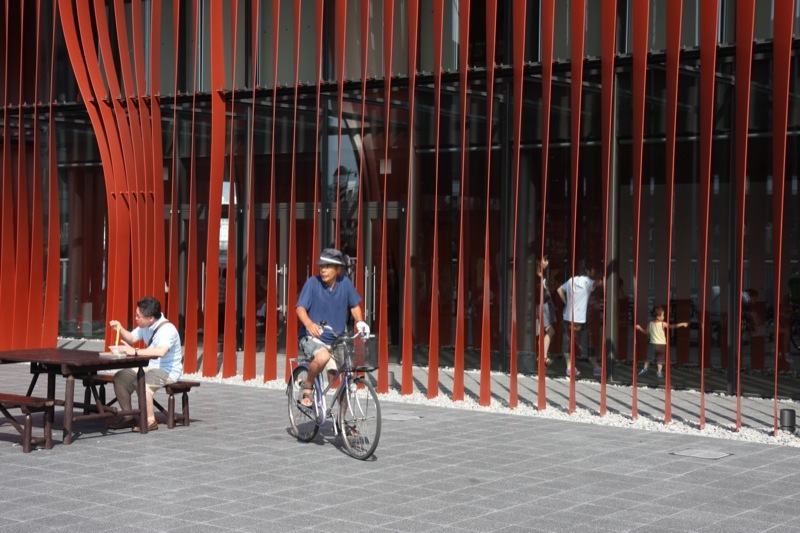 The modular magnetic system allows you to join two of the same type of element such as 2 softwalls to create a longer wall or you can join softseating benches to softwall + softblock elements, mix and match materials, colour and sizes or really anything you can imagine. 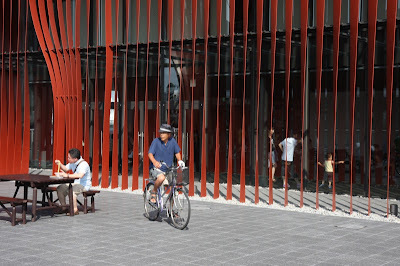 The workspace of the future is going to have to be more flexible due to new technologies. 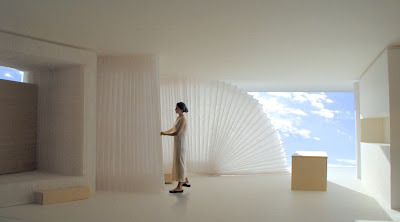 How is Molo’s soft pleating walls redefining the modular concept for working environments? The flexible softwall partitions give people the freedom to shape their own work environments in a spontaneous way. You can create and impromptu meeting room or private work area within an open office space very quickly and simply. 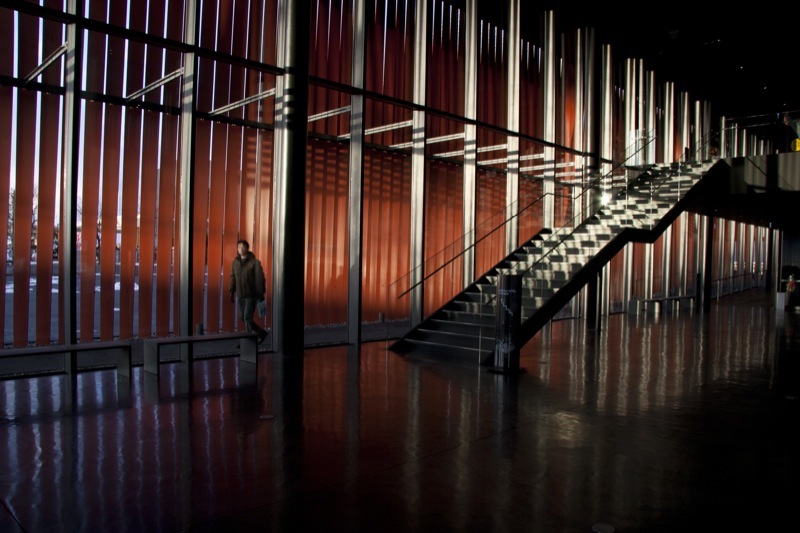 Additionally the softwalls have internal tunnels that allow you to run wires and cables in a tidy way. These are the same tunnels that you have the option of running an LED ribbon to illuminate the textile softwalls. Thank you molo for bringing us into your creative world!!! The way they use the softwalls is genius. Adds the feeling of movement to the space while putting in something permanent. Very nice. Mod Design Guru's One Year Birthday!